In today’s selfie, social media and celebrity-obsessed world, it is hard to imagine that we do not actually know what two of the most famous literary figures—William Shakespeare and Jane Austen—actually looked like. Yet, 400 and 200 years after their respective deaths, their faces adorn everything from bobbleheads and cookie cutters to prints and figurines. "Will & Jane: Shakespeare, Austen and the Cult of Celebrity" is a new exhibition at the Folger Shakespeare Library that examines their literary afterlives and how milestone events and artifacts (like the shirt Colin Firth wore in the 1995 BBC mini-series "Pride and Prejudice" that helped turn the actor into a heartthrob) have affected their legacies and popularity. Curated by Carnegie Mellon University’s Kristina Straub and the University of Texas’ Janine Barchas, "Will & Jane" reveals that, despite a two-century age difference, they both experienced similar posthumous arcs. They also both share a celebrity status beyond their literary expertise that was created through repetition and reproduction. The exhibition provides a glimpse of this by displaying more than 150 pieces, from the obscure pile of sticks from a chair Shakespeare may have once sat in to a copy of a ring once owned by Austen that the Jane Austen House Museum won’t let leave England. (Ask Kelly Clarkson. She bought it, tried to bring it to the U.S. and had to sell it back). "We were surprised by the tight parallels between Will and Jane at their respective 200-year markers. As a result, our show compares the first wave of so-called Bardolatry in the eighteenth century with today's Cult of Jane. Modern celebrity culture—with its merchandizing, souvenir trade, and passion for relics—still looks very much like it did in the Georgian era. Celebrity pinups of David Garrick and Edmund Kean were the Justin Bieber posters of yesteryear," said Barchas, professor of English and Austen expert who even teaches an “Austen in Austin” course at the University of Texas. The Shakespeare-Austen combination is resonating for Folger visitors. "'Will & Jane' is, at its core, about love, but not just in and for the stories of Shakespeare and Austen. 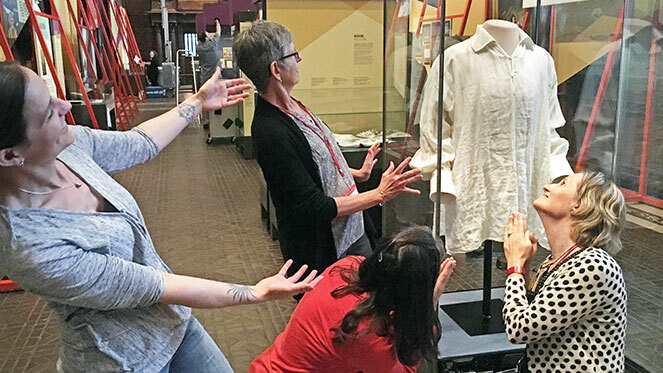 Remarkably, the exhibition also celebrates the love readers and audiences have for each other when bound by the passion of shared experience, longing, and desire," said Racheline Maltese, a romance author. For Straub, professor of English in CMU’s Dietrich College of Humanities and Social Sciences, working on "Will & Jane" for nearly four years was a lot of fun. "As Janine and I worked on the exhibition, it became clear to us that serious scholarship and fun are not mutually exclusive," Straub said. "We hope that 'Will & Jane' helps people think more critically about how we as a culture create meaning in our lives through everyday trivial objects like cookie cutters or rolling pins. But we also hope that people will embrace the playfulness of plastic action figures and bobbleheads that express and perpetuate celebrity." So far, the reaction from those who have seen it has been overwhelmingly positive. Afton Lorraine Woodward, a writer at virtuosoblog.com, said, it "tells a fascinating story of pop culture and literature through the centuries." Holly Dugan, associate professor of English at the George Washington University, agreed and said, "As a teacher of Shakespeare, I'm thrilled to see an exhibition that provides a compelling overview of how we've marketed these two literary 'greats.' And as a fan of Austen, I'm happy to indulge my love of her works. Its surprising exhibits include action figures, grave rubbings and even the shirt worn by Colin Firth as Darcy in the BBC's adaptation of 'Pride and Prejudice.' It's entertaining and educational." In true celebrity cult-like fashion, "Will & Jane" has created a buzz. The New York Times and Washington Post have covered it. And, the New Yorker even parodied the aforementioned Colin Firth/Mr. Darcy shirt’s celebrity appearance in the U.S.
"Will & Jane" runs through Nov. 6. Photo courtesy of Ben Lauer at the Folger Shakespeare Library.